The New Amsterdam Plein & Pavilion is a gift from the Netherlands to New York, to honor 40 years of friendship. 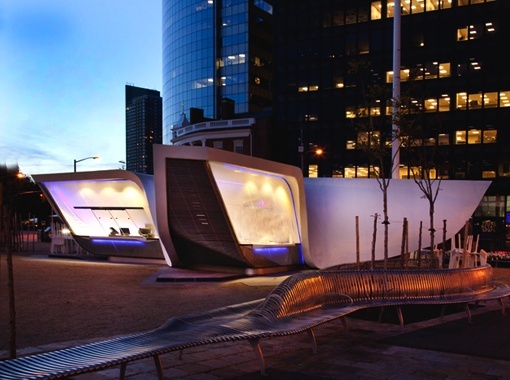 The Pavilion designed by Ben van Berkel is located in Peter Minuit Plaza, just outside Battery Park in Manhattan. The Pavilion is equipped with different displays and functions that are supposed to encourage visitors to interact with them. There is a display that provides information about the surrounding neighborhoods, another one serves as a information desk and another one gives information about events in the Netherlands. There's even one facade that will present a food and beverage outlet; seats and tables can be found outside. The Pavilion's wings represent a well thought out design as they point towards historical places. One wing, for instance, points toward Hudson and another one points toward the future skyline. Furthermore the pavilion is equipped with an electronic facade LED system that creates a changing light show at night.